To hear a talk by Billy Gawn is a delight. Two days of it (in the company of 20 like-minded individuals) left me feeling as if I had spent a weekend at a health spa. Billy has become something of a legend in his own later lifetime, at least in dowsing circles. Yet, no doubt, to hear himself described in such terms would elicit no more than a quiet Irish chuckle and a Gallic shrug. His range of understanding is well-known and his personal research is, in its own niche way, ground-breaking. Yet it is not so much the quality of his talent that is so remarkable, as the engagingly straightforward manner that potentially life-changing ideas are presented as just everyday working hypotheses. Billy is as down-to-earth as a pebble on a beach, and he has a wonderful way of making the most profound insights into casual comments. We started the course in familiar BG territory, examining the various sources of energy on the face of the earth. Then we looked at various earth energy patterns – lines and spirals, domes and vortices, labyrinths and serpents. We found them all in the Alton Barnes Coronation Hall (circa 1953). I suddenly realised that the patterns I had traced for over a decade were on just one level of magnitude of this incredibly complex manifestation. There were tiny, even microscopic, versions – presumably reducing to the infinitely small – and others ascending to the unimaginably large. See what I mean about profound! Another BG hallmark is the consideration of the impact of the planets on the energies of one another. This tends to be detected on the earth’s surface as a series of grids – tighter ones for the larger, closer planets – wider mesh for the smaller, more distant ones. We found plenty of them amongst the cow-pats of the field next to Alton Priors church. Billy was keen to invite us to examine the impact of phases and eclipses on these grids – and on other energies – and on just about everything else. Again a trap-door opened into a void of possible comprehension, with the guru simply smiling quietly in his tweed jacket and musing that he had no idea what lay beyond it. So wide is the range of topics that tend to come up during a BG discussion that the tutor is often left with little option but to invite the questioner to undertake their own research. We even came back from the pub to view the energy emanating from the obligingly bright moon, nearing its maximum. Billy pointed out the streams of energy spiralling down to the earth. Some peered at the sky, some of us looked at one another, a little perplexed. Transferring the theory into practice was not always that easy – clearly more practice was required. But Billy is as at home with the minutiae of the subject as with the big-picture so dear to people like myself. When we got onto deviceless dowsing, BG was in his element. He has developed a style of seeing energies – or more accurately being drawn by his eyes to the target area – without the use of rods or pendula. While there are a growing number of deviceless operatives, Billy’s use of the eye muscles as dowsing rods is particularly impressive. The theory is deceptively straightforward. Start with the rods, take the rods away and sense the hand muscles, then transfer that awareness to any other part of the body that takes your fancy. Easier said than done. However, amongst the tussock grass of the Wiltshire countryside, I did have a couple of goes with some success – and I did sense that I sensed some sought-after energies without either device or sight. Whether this was beginner’s luck or the temporary removal of a subtle barrier time alone will tell – of course, some would say it’s the same thing. More profundity in the margin. We went on to study the three-dimensional structure of earth energy lines. Many of these turn out not to be lines at all, but coils – and just for good measure, the ‘lines’ making up the coils are coils too – and so on. In a wonderful aside, Billy went on to explain how he had traced many of these continuous spirals whilst on holiday on a deserted beach in Spain – as sections of dissociated coil waiting to be attracted back into the more familiar linear structure. All part of the great cycle of the birth and death and birth of an energy line – integration followed by dis-integration ad infinitum. I was caught between excitement and overload, but continued looking at my feet, hoping to come up with the words to ask a sufficiently sensible question to bring this idea into focus. The course then went on to probe the impact of built structures on the dowsable shapes of earth energy. 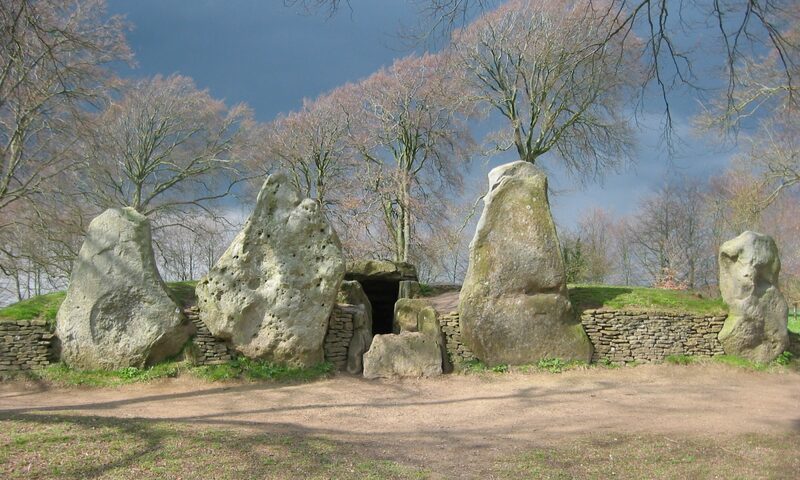 Dolmens and pyramids, tepees and yurts all came under the microscope. I now understand that the native North Americans did not live in a tent in a field, nor are dolmens a just a significant pile of stones. While I suppose I knew this already on one level, BG has a way of leaving you affirming your own assumptions in such a way that they become the building blocks of useful knowledge that leads – maybe one day – to wisdom. I came away with enough ideas for a book – indeed several books – but then they wouldn’t be my books at all! But like the planetary grids, Billy’s concepts are so vast that they don’t transfer easily to the confines of the written page. I could listen to Billy Gawn for hours – and hopefully I will, for many years to come.